With respect to 1, the the leaders of COMMIT/ are trying to create a cohesive program and not just a bunch of separate projects that happened to be funded by the same source. This is going to be a hard task but the kickoff was a good start. The event focused extensively on networking exercises, for example, developing demonstrator ideas with other mixed groups of partners. In addition, they gave out t-shirts which is always a good way to create cohesion Indeed, the theme of the event was try to position COMMIT/ as an unfolding story. 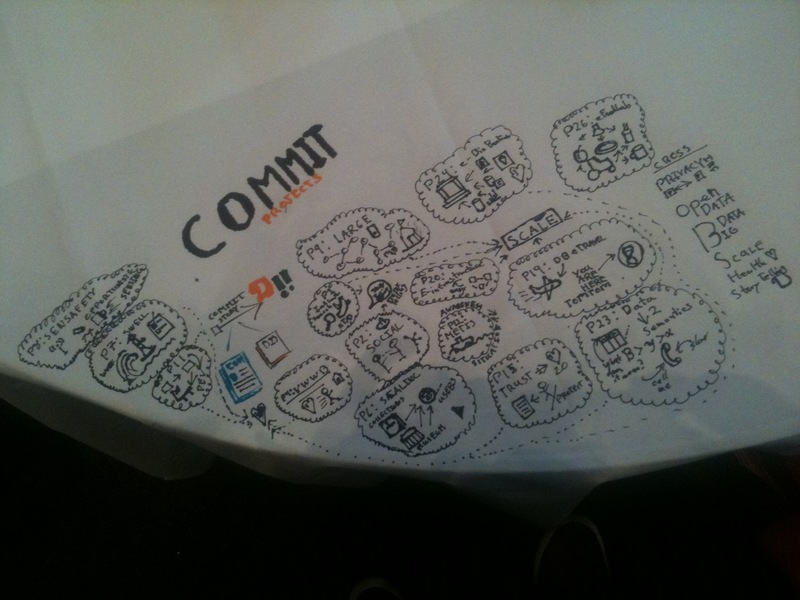 The event was well organized and it was great two be able to network under the COMMIT/ banner. The program is just beginning so it will be interesting to see how the story progresses whether indeed these various already big projects can be brought together. Last week, I attended a workshop at Dagstuhl on the Principles of Provenance. 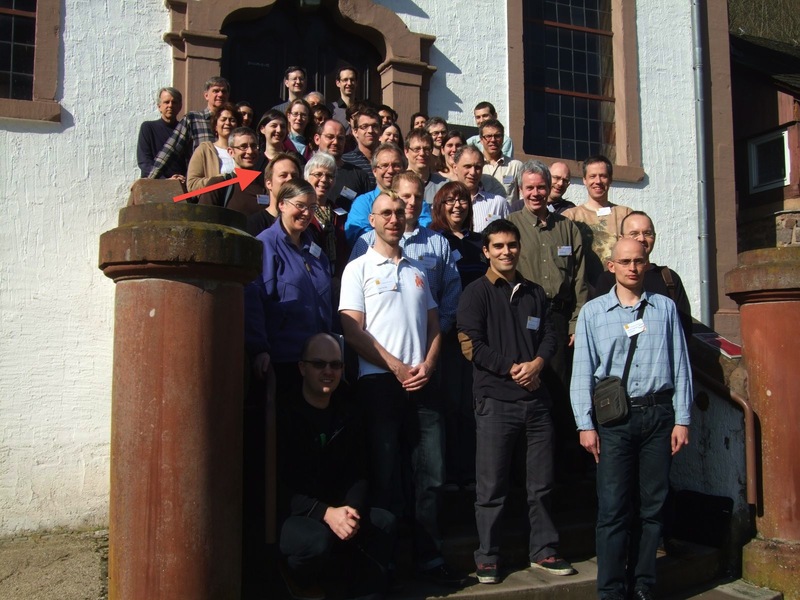 Before talking about the content of the workshop itself, it’s worth describing the experience of Dagstuhl. The venue itself is a manor house located pretty much in the middle of nowhere in southwest Germany. The nature around the venue is nice and it really is away from it all. All the attendees stay in the manor house so you spend not only the scheduled workshop times with your colleagues but also breakfast, lunch, dinner and evenings. They also have small tricks to ensure that everyone mingles, for example, by pseudo-randomly seating people at different tables for meals. Additionally, Dagstuhl is specifically for computer science – they have a good internet connection and one of the best computer science libraries I’ve seen. All these things together make Dagstuhl a unique intellectually intense environment. It’s one of the nicest traditions in computer science. These tutorials were a great idea because they provided a common basis for communication throughout the week. The rest of the week combined quite a few talks and plenty of discussion The organizers are putting together a report right now containing abstracts and presentations so I won’t go into that more here. What I do want to do is pull out 3 take-aways that I had from the week. Because provenance often spans multiple systems (my data is often sourced from somewhere else), there is a need for provenance systems to interoperate. There have be a number of efforts to enable this interoperability including the creation of the Open Provenance Model as well as the current standardization effort at the W3C. Because these efforts are trying to bridge across multiple implementation, they are driven by community consensus: what models can we agree upon, what is minimally necessary for interchange, what is easy to understand and implement. During the workshop, it became clear to me that the consensus based models (which are often graphical in nature) can not only be formalized but also be directly connected to these database focused formalizations. I just needed to get over the differences in syntax. This could imply that we could have nice way to trace provenance across systems and through databases and be able to understand the mathematical properties of this interconnection. For a couple of years now, I’ve been asked by people and have asked myself, so what do you do with provenance? I think there are a lot of good answers for that (e.g. requirements for provenance in e-science). However, the community has spent a lot of time thinking about how to capture provenance from a technical point of view asking questions like: how do we instrument systems? how do we store provenance efficiently? can we leverage execution environments for tracing? At Dagstuhl, Carole Goble asked another question, why would people record and share provenance in the first place? There are big social implications that we need to grapple with: producing provenance may expose information that we are not ready to share, it may require us to change work practice leading to effort that we may not want to give or it may be in form that is to raw to be useful. Developing techniques to address these issues is from my point of view a new and important area of work. From my perspective, we are starting to work on the ideas of how to reconstruct provenance from data that will hopefully reduce the effort for producers of provenance. A key usecase for provenance is tracking back to original data sources after data has been integrated. This is particularly important when the data integration requires complex processing (e.g. natural language processing). Christopher Ré gave a fantastic example of this with a demonstration the WiscI system part of the Hazy project. This application enriches Wikipedia pages with facts collected from a (~40 TB) web crawl and provides links back to a supporting source for those facts. It was a great example of how provenance is really foundational to providing confidence in these systems. Beyond these points, there was a lot more discussed, which will be summarized in the forthcoming report. This was a great workshop for me. From my point of view, I wanted to thank the organizers for putting it together. It’s a lot of effort. Additionally, thanks to all of the participants for really great conversations.